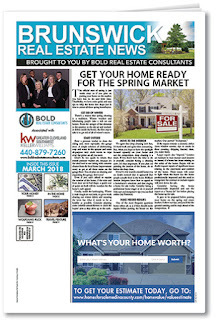 In case you missed it, click to read our second edition of the Brunswick Real Estate News! We hope you were able see our first issue and found it useful and entertaining. We are excited to bring the next one to you here. On the cover, we give you some ways to quickly get your home whipped into shape and ready for the spring market. Turn to page 2 to find out about some exciting events happening in the Brunswick area. In addition, you'll also find some great travel and decorating articles, as well as a delicious recipe from Wolfgang Puck.